Happy Sunday! Welcome to Holy Shift, where we highlight big innovations in the auto and racing industries each week—whether they be necessary or simply for comfort. Without aerodynamics, cars—and airplanes, spacecraft, even bobsledders—are just objects displacing wind. Displacing wind inefficiently, at that. Learning how to maneuver aerodynamic drag on those objects usually warrants a trip to the wind tunnel, where engineers test the most minute of aerodynamic details. But don’t be fooled by the innovative capabilities of the wind tunnel. The device surfaced long before the automotive industry gained a footing, with its creation dating back to 1871. Yes, even Wilbur and Orville Wright had one. Before automakers and race engineers began to refine their craftsmanship in the tunnel, aeronautics pioneers developed it in order to make attempts at flight. That’s right—there weren’t functioning airplanes to test at the time that the tunnel came about. The Wright brothers developed their own wind tunnel in 1901, in which History reports that the pair tested “nearly 200 wings and airframes of different shapes and designs.” The first flight came over 30 years after the original wind tunnel in 1903, when the Wright brothers kept their craft afloat for 12 seconds. Testing within wind tunnels became an essential part of World War II, according to the University of Washington Department of Aeronautics and Astronautics. Once the war use wound down a bit, race engineers caught onto the technology and and passenger cars followed after. The car or plane inside never moves, but the fans create wind at different speeds to simulate real-world conditions. Sometimes a real car won’t even be used — designers often rely on exact scale models of their vehicles to measure wind resistance. As wind moves over the car in the tunnel, computers are used to calculate the drag coefficient. 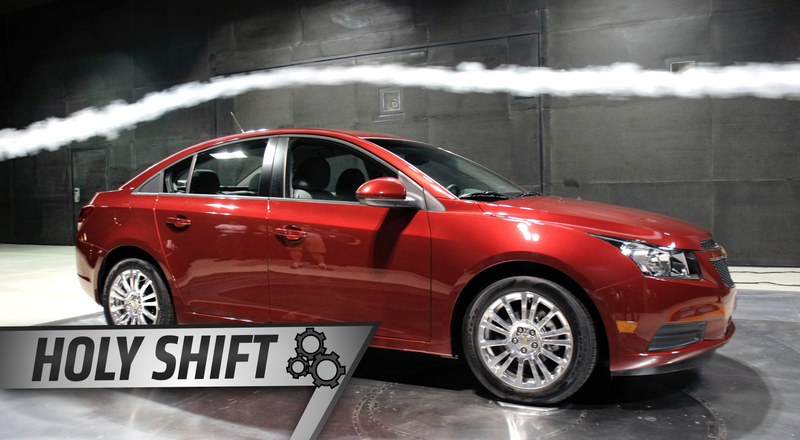 Modern-day wind tunnels are essentially just a giant, enclosed hair dryer for your car, minus the heat (and split ends, hopefully). A wind tunnel located in North Carolina—in other words, NASCAR central—even has what can only be described as a car treadmill inside, capable of simulating speeds at 180 mph. Boy, have things gotten fancy since the first attempts at wind tunnels. Things continue to get fancier as well—according to How Stuff Works Science, plenty of “wind tunnel” testing occurs on computers these days. In those cases, a trip to the actual wind tunnel is to back up the simulated test results. That same kind of approach also made its way into crash testing, as computer simulation continues to become more popular for running test wrecks, making tweaks to the design and running them once again. Constructing full-size wind tunnels—and crashing vehicles—is expensive, and testing in the virtual world saves a buck or two (maybe a few more). But, as grandma will always say, “the real world is better than those computers you kids play on all day.” If there’s any reason to keep the real-world testing around, it’s just plain cool. If you have suggestions for future innovations to be featured on Holy Shift—in street cars, the racing industry or whatever you’d like—feel free to send an email to the address below or leave them in the comments section. The topic range is broad, so don’t hesitate with your ideas. Contact the author at alanis.king@jalopnik.com.